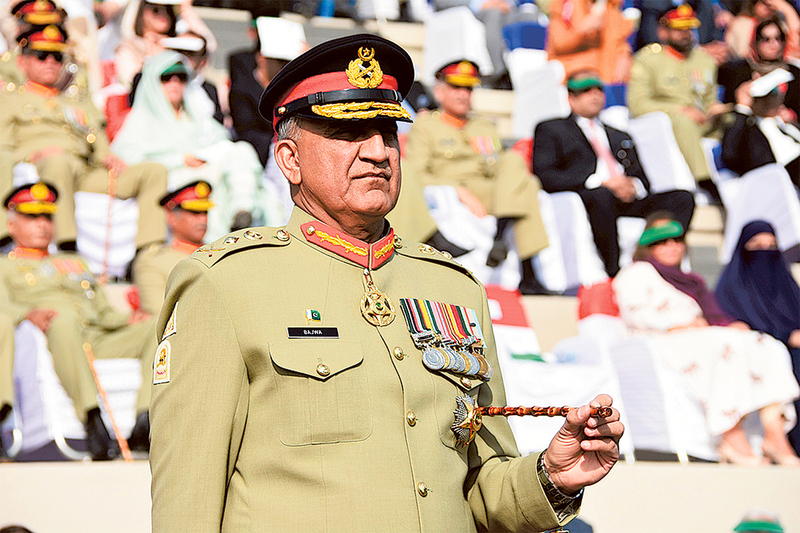 Dubai: The appointment of General Qamar Javed Bajwa as the new Army Chief of Pakistan may have come as a surprise to many, but analysts say it was most suited for the country. Some called Bajwa a ‘dark horse’ in the race for the most powerful post in the country, as he was fourth in order of seniority on a list of four generals whose names were finalised by the army command for the position. Though he was not favourite, he was very much a hot contender due to his strong credentials and his belief in keeping the armed forces away from political involvement. The 57-year-old Bajwa became the 16th army chief of Pakistan as he took charge Tuesday from outgoing General Reheel Sharif. His selection as army chief is seen as a bid by Prime Minister Nawaz Sharif to place civil-military relationship in Pakistan on an even keel in a country where the military has always dominated the civilian government. Analysts believe Gen Bajwa will certainly try to work smoothly with the civilian government in order to avoid any unnecessary controversy. It is not just the prime minister who picked the army chief. The formal process for nomination starts with the General Headquarters of the armed forces sending a list of the most senior generals to the PM via the defence ministry, but without making any formal recommendations. The recommendations include credentials of the listed generals including the ‘positives and negatives’ of their careers. The PM takes a decision according to the recommendations. Bajwa was chosen for the powerful position because his testimonials are overwhelmingly positive. Those who know him say he is a proponent of strong civil-military relations — the main reason why Prime Minister Nawaz Sharif selected Bajwa for the job. He is not seen as reflexively hostile to India, and he once served alongside an eventual Indian army chief, General Bikram Singh, while on a United Nations mission in Congo. General Singh, according to the Hindustan Times, described Gen Bajwa as an ‘outstanding and professional soldier’. Bajwa has extensive experience of handling affairs in Kashmir and the northern areas of the country. As a major general, he led the Force Command Northern Areas. He is said to consider extremism a bigger threat for the country than India. “He is extremely professional, but very easy-going and full of compassion,” an officer who had served under him said, adding he was not protocol-minded either. Gen Bajwa is also said to be apolitical, without any biases. Analysts say Bajwa may prove even more forceful in the fight against militants, including the domestic armed groups, than his predecessor General Sharif, who is credited with launching Operation Zarb-e-Azb in an effort to wipe out terrorism in the country. Born in Gakhar Mandi, Gujranwala, Gen Bajwa was commissioned on October 24, 1980 in the 16 Baloch Regiment, the battle-hardened force that in the past has given three army chiefs, including Gen Yahya Khan, Gen Aslam Beg and Gen Ashfaq Parvez Kayani. According to the Inter-Services Public Relations (ISPR), he is a graduate of the Canadian Forces Command and Staff College-Toronto, Naval Post Graduate University-Monterey, California and National Defence University (NDU)-Islamabad. Bajwa is taking over the army command at a time when the country is faced with serious internal and external challenges. Though the overall security situation has improved significantly during the tenure of outgoing army chief, recently increased tension between India and Pakistan, Afghanistan situation and the recent upsurge in terrorist attacks in Balochistan and tribal areas are some of the major challenges ahead for the new army chief. General Raheel Sharif is considered one of the most respected and popular army chiefs of Pakistan. He has achieved many a milestone during his tenure from 2013 to 2016. Following are some of his major achievements. 1. Zarb-e-Azb: The high point in the tenure of Gen Raheel Sharif was the start of Operation Zarb-e-Azb in North Waziristan against the Tehreek-e-Taliban Pakistan in June 2014, an operation which was considered extremely vital to curbing terrorism in the country. As a consequence, the overall security situation has improved and terrorist attacks in Pakistan dropped significantly. The general has been one of the most frequent visitors to the restive Federally Administered Tribal Areas (FATA). 2. National Action Plan The plan came to force after the deadly December 16, 2014 attack on Peshawar APS killing 149 students. It was hard to bring all political forces to one table. However, consensus was achieved without much difficulty. The National Action Plan (NAP) is an essential part of Pakistan’s war against terrorism, as it has co-relationship with the military’s operation Zarb-e-Azb, including other related-issues. Gen Raheel Sharif played a key role in the implementation of the NAP. 4. Karachi Operation: The Karachi operation is another success story. The metropolitan city had become home to notorious crime syndicates. The Karachi operations resulted in the disruption of mafias and militants, who now stand on the verge of total elimination. .
5. Peace in Balochistan: The army, under the leadership of Sharif, played an important role in restoring peace in Balochistan. The provincial government has said it stands by the army in efforts to ensure durable peace in the province. Second and third tier leadership of rebel organisations are disassociating from their exiled top leaders. 6. FATA Reforms: The development of the FATA was a priority of General Raheel Sharif. The Pakistan army has undertaken 178 projects so far in the social, communication infrastructure and power sectors of Fata and Malakand areas. These projects are aimed at improving the quality of life in the tribal areas and address the problem of militancy on a long-term basis. 7. CPEC: Sharif vowed Pakistan’s security forces were “ready to pay any price to turn the US$47 billion (Dh172 billion) China Pakistan Economic Corridor (CPEC) into reality.” A Special Security Division consisting of over 15,000 troops has been raised to protect the CPEC projects. 8. Highest national award of Brazil ‘Order of Merit’: General Sharif was awarded Brazil’s coveted ‘Order of Merit’ award in a ceremony held in the South American country on November 25, 2015. He is also the first Asian to have received the award. The chief of army staff was given the award in recognition of his leadership in the fight against terrorism. 9. Support for democracy: During Pakistan Tehreek-e-Insaf (PTI) and Pakistan Awami Tehreek (PAT) sit-ins, speculation was rife that the army chief might step in to prevent further chaos. Gen Raheel held a one-on-one meeting with the embattled premier, categorically assured him that the army had no intention of resorting to any unconstitutional step and advised him to resolve the controversy politically. 10. Anti-Corruption Drive: Gen Raheel Sharif is also hailed for launching an anticorruption drive mostly focused against corrupt politicians. He dismissed several high ranking military officers over charges of corruption.